We expected the Thai current account surplus to widen, but not by this much. The $2.4bn figure was double the consensus estimate. The figures come from the Bank of Thailand balance of payments and we'd gleaned from the earlier release of the customs-basis trade balance, which returned to surplus in September after two consecutive months of deficits, that the current account surplus was rising. 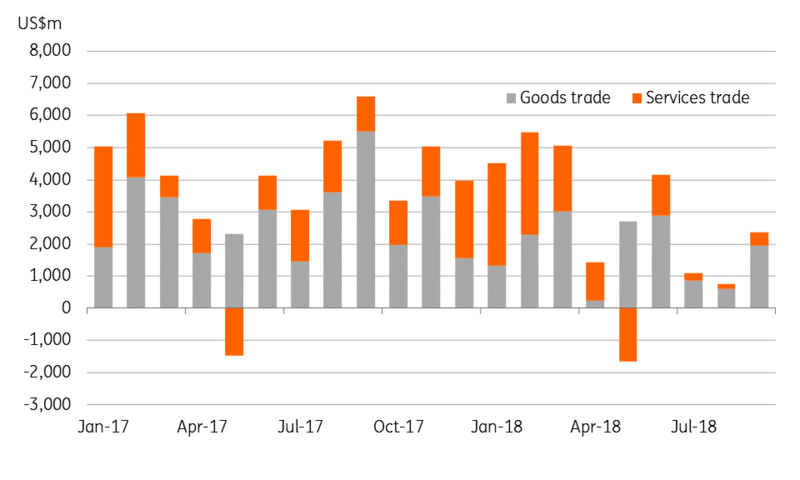 Clearly, the boost came from the goods trade, with the surplus here jumping to close to $2bn in September from $604m in August. This came off a -5.5% year-on-year export growth, consistent with the customs data, and 14.3% import growth, much stronger than the 9.9% in the customs data. The inflows from services, income, and current transfers combined also improved to $406m from $149bn. However, inflows on this side have been anaemic compared with a year ago, as you can see in the chart below. Slowing visitor arrivals have most likely weighed down the tourism receipts. The overall payments balance posted a surplus of little over $1bn in September, more than five-fold increase over the August level. The cumulative current surplus in the first nine months of 2018 was $25.9bn, about $12bn below the year-ago level. Our forecast of the annual surplus narrowing to the equivalent of 7% of GDP this year from over 11% in the last two years remains on track. Although the current account surplus is still large enough to support the currency outperformance, the THB seems to have lost its lustre and has ended the month of October among Asia’s worst performers with 2.4% depreciation against the USD, the second-worst monthly performance of the currency this year after a 3.4% depreciation during the June emerging- market selloff. The USD/THB has already traded through our 33.0 end-year forecast. Beyond a transitory relief, we don’t think the FX market is likely to take much comfort from today’s strong data. We revise our end-year USD/THB forecast to 33.6 (spot 33.2).